Their names are synonymous with the visual and performing arts, with higher education and medical research, with mental health and youth advocacy. 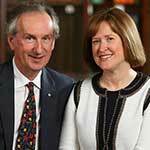 But for philanthropists Fred (1948 – present) and Elizabeth (1958 – present) Fountain, their support of Dalhousie — and of the performing arts, in particular — combines elements of all the causes they are passionate about. Indeed, the transformation sparked by their $10 million gift that established the Fountain School of Performing Arts in 2013 has benefitted not only the university but the entire region, positioning the Dalhousie Arts Centre as the primary talent incubator on Canada’s East Coast. With their daughter Katharine also an accomplished musician, the Fountains have always been keen supporters of the arts, actively involved with Neptune Theatre, the Art Gallery of Nova Scotia and the National Arts Centre to name a few. They are familiar faces at the Dalhousie Arts Centre, regularly attending performances and getting to know the students by name. Their support of Dalhousie is longstanding and distinguished, with many awards and honours recognizing their generosity. That support continues in 2018, in their role as honorary co-chairs of Dalhousie’s Performing Arts Campaign and with their $2 million gift to the capital project. Looking ahead, Mr. Fountain says he would like his personal legacy to be that he was an engaged contributor who always had the university’s best interests at heart. The Fountain School of Performing Arts is certainly a fitting testimony to that legacy.